Good Shot Judy specializes in delivering top-notch Classic Vocal Jazz and recreating the classic nightclub entertainment feel of Las Vegas in its prime. Think Frank Sinatra, Dean Martin, Count Basie, glitz and glamour. Real entertainment from an era that was not only filled with great singers, performers, and great songs, but whose legacy has become synonymous with what great entertainment really is. It doesn’t end there though. 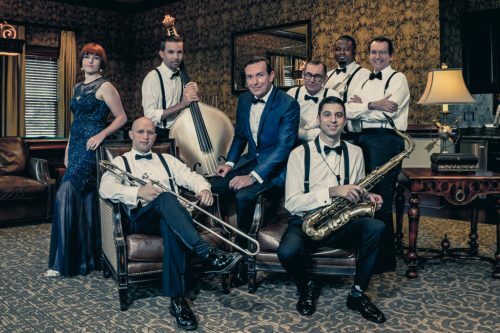 Possessing a large repertoire of classic swingin’ big band hits, Good Shot Judy is also equally adept at delivering classic ballads, and cocktail music. Performing in configurations as small as a quintet, and as large as the twelve-piece big band gives the group the versatility to meet the needs of virtually any client. From intimate cocktail parties, brunches, and weddings, to festivals, corporate events, and large theater shows, Good Shot Judy can customize the group size and repertoire to perfectly compliment the atmosphere and budget of almost any event. In addition, every member who performs in any Good Shot Judy configuration is a seasoned professional. From cruise ships, to sports stadiums, we’ve logged thousands of performances between us, at every type of venue you can think of, so you can rest assured that your guests will enjoy being entertained by professional performers.